A unique, proprietary implementation of immersed boundary (IB) technology that enables geometry to be immersed into Cartesian grids, eliminating meshing, maintaining the integrity of cells, and speeding CAD-to-CFD iterations throughout the design cycle. The use of pre-designed apps that automate, simplify and speed set-up for industry-specific simulations. A flexible pricing structure that enables users to take full advantage of the latest hardware advances at no extra software cost. A personal, one-to-one, responsive technical support, bringing the benefits and experience of complex engineering problem-solving across a broad range of industrial sectors - no call centers! - Time dependent Boundary Conditions: allow to set a variation function (ramp, step, exponential and sine) to boundary condition variables. - Standard K-epsilon turbulence model. - New licensing option to offer higher value for money to the users, tayloring the KARALIT CFD to the needs of the customers with product version specific for industrial sectors (automotive, architecture engineering and construction, oil and gas, etc.). - Speed-up of cell distance calculation. - New feature of smoothing (allows for a more gradual transition from the tiniest cells' dimension to the typical size of the background mesh) and mesh sealing in the gridgen (the grid is prevented from entering small gaps in the STL surface that are at sub-grid scale). - STL triangulation filter (hole filling) for healing STL surfaces: holes with size smaller than a specified quantity are sealed. - The problem's geometrical definition is provided through SURFACES in form of .STL (StereoLithography) files. Tools are provided to EDIT, DIVIDE and/or SELECT part of surfaces in order, for example, to enforce BCs. It allows users to generate Cartesian anisotropic meshes with assigned target grid size in normal and tangential to the wall directions. Users can also define how many times the finest mesh layer has to be replicated while moving out of the wall and how many transitional layers have to be used before reaching the grid's base line dimension. An arbitrary number of box or sphere refinement windows can be assigned, as well as symmetry or periodic conditions. The following boundary conditions are available throughout the APPs depending on specific APPs and type of fluid. The Free APP offers full access to all BCs. * 2 GHz CPU speed or higher. For superior performance, KARALIT recommends an Intel Xeon®, or AMD Opteron™ processor, and 24 GB RAM or higher. ** KARALIT recommends settings that allow your operating system to manage virtual memory, as needed. There should always be at least as much free hard disk space as system memory (RAM). 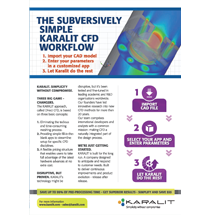 The KARALIT approach, called Direct CFD provides simple fill-in-the-blank Apps to streamline setup for specific industries. 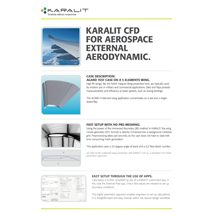 KARALIT provides two Apps for aerospace external aerodynamic simulations: "External Flow" and "Wind Tunnel". Both customized Apps walk the user through the necessary inputs to set up boundary conditions, flow regime and other parameters. 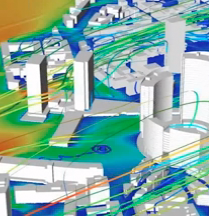 Within minutes, even CFD novices can begin running high-quality simulations. KARALIT has developed a "Wind Tunnel" App, to help deisgners and CFD analysts during the aerodynamic study of the car. The App can be used for studies of factors such as airflow around car bodies, pressure distribution, turbulence and drag. Users simply enter the parameters for key factors and the app takes over, setting up the boundary conditions for a highly accurate simulation. of buildings and on walkways, smoke dispersal and fire safety: it can also be used for energy efficiency inside building walls and antennas. Another app, named "Environmental Terrain Flow" App, has been designed to perform a wind site assessment study. As for all KARALIT Apps, setting up the simulation involves only a few minutes of user time to input parameters. 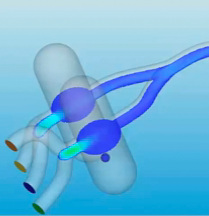 the App, enter a few key inputs – such as the boundary conditions, fluid properties and flow regime, going from CAD to simulation in a few minutes. 1. Eliminating the tedious and time-consuming meshing process. 2. Providing simple fill-in-the-blank apps. 3. A flexible pricing structure. 4. A personal, one-to-one, responsive technical support: no call centers! High lift wings, like the NASA Trapped Wing presented here, are typically used by modern jets in military and commercial applications. 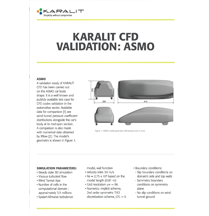 See how KARALIT’s mesh-free, app-driven approach takes you from CAD to CFD simulation in just minutes. 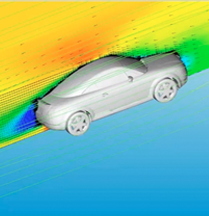 This simulation is used to investigate body aerodynamics based on a Daimler Benz research model. Preprocessing takes only seconds and the KARALIT app enables design engineers to set up calculations in a few minutes. When designing a new park, a subway station or other public structures, architects need to go beyond aesthetics to ensure pedestian comfort and safety. Using the power of the Immersed Boundary (IB) method, the urban environment model geometry (STL format) is directly immersed into a background Cartesian grid. Preprocessing takes just seconds, as the user does not have to deal with time-consuming mesh generation! KARALIT CFD is not just an efficient tool to allow architects or civil engineers to easily understand the 3D flow around buildings for predicting comfort indices or pressure distribution on building facades, but it can also be efficiently used to predict 3D airflow and all Heating, Ventilating and Air Conditioning (HVAC) systems in indoor environments. Valves are used in a variety of engineering disciplines, including aerospace, automotive, oil & gas, transportation, medical and other applications. 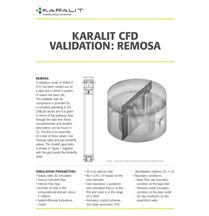 See how easy it is to set up KARALIT simulations for key performance parameters such as critical valve flow characteristics and the induced torque on the disc. KARALIT has developed a "Wind Tunnel" App, that can be used for studies of factors such as airflow around car bodies, pressure distribution, turbulence and drag. Users simply enter the parameters for key factors and the app takes over, setting up the boundary conditions for a highly accurate simulation. The "Building Flow" App can be used for build environment applications such as pedestrian comfort outside of buildings and on walkways, smoke dispersal and fire safety: it can also be used for energy efficiency inside building walls and antennas. As for all KARALIT Apps, setting up the simulation involves only a few minutes of user time to input parameters. KARALIT simulations using the immersed mesh technique predict the correct trends of flow-field streamlines and Cp distribution on the ASMO idealized car body shape. 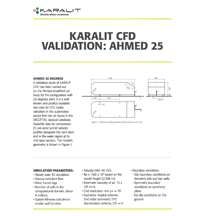 KARALIT'S immersed mesh technique is used to predict the correct distribution and trends of streamlines and velocity fields for the Ahmed Body, a simplified car model for the configuration with 25-degrees slant. KARALIT'S immersed mesh technique is used to predict the correct distribution and trends of streamlines and velocity fields for the Ahmed Body, a simplified car model for the configuration with 35-degrees slant. 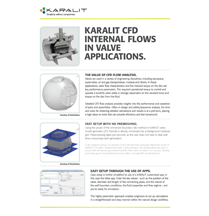 A validation study of KARALIT CFD has been carried out on a pipe line in which a system of valves has been set. 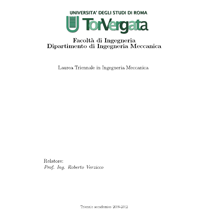 "Estimation of the immersed boundary technique for industrial fluid dynamic simulation". "Application of the Ghost Cell Method for monitoring flows". "Fluid Dynamic Optimization of an underground station with the support of the Immersed Boundary KARALIT CFD software". 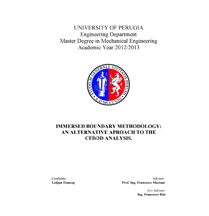 "Immersed Boundary methodology: an alternative approach to the CFD/3D analysis". 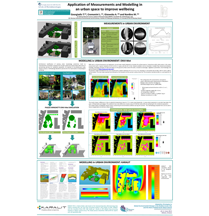 "Application of Measurements and Modelling in an urban space to improve well-being". "A hybrid immersed boundary CFD approach to oil & gas applications"
"Immersed boundary technique for turbulent flow simulations"
"Combined immersed–boundary/finite–difference methods for three–dimensional complex flow simulations"
"Direct numerical simulation of the pulsatile flow through an aortic bileaflet mechanical heart valve"
"Effects of non perfect thermal sources in turbulent thermal convection"
"A ghost-cell immersed boundary method for flow in complex geometry"
"Ghost Fluid Method for Strong Shock Interactions Part 2: Immersed Solid Boundaries"
"Adaptation of a k-epsilon Model to a Cartesian Grid Based Methodology"
"A Cartesian Grid Method with Transient Anisotropic Adaptation"
"Dynamic wall modeling for large-eddy simulation of complex turbulent flows"
"Turbulent Wall Model for Immersed Boundary Methods"